This user, unfortunately, wasn’t getting all of those options. So I was off to do a little research. It turns out that a key difference between his e-mail account and mine was the culprit. My e-mail accounts (of which I have too many) are all set up as POP3 accounts while his e-mail is set up as an IMAP account. So what’s the difference between the two? Briefly, and without getting too technical, POP3 and IMAP are two different e-mail access protocols. POP3 e-mails are downloaded to your local e-mail client (like Outlook), and any changes you make to the e-mail (such as deleting it or flagging it) are done on the local copy sitting on your hard drive. IMAP e-mails, on the other hand, are always left on the server. Any changes you make to the e-mail are reflected in the original e-mail stored on the server and can be seen by anyone who logs into the webmail account. While most people (in my experience) use POP3 e-mail accounts, IMAP accounts are good for e-mail addresses that need to be accessed by multiple people (such as a helpdesk account or an information e-mail for an organization). Because flagging the e-mail would necessarily require that it be stored locally (since the flag is an Outlook function that wouldn’t reside on the server), this reader wasn’t able to flag his IMAP e-mails with anything other than a generic flag. If you’re an IMAP e-mail user and have a better solution, though, be sure to leave the details in the comments section below. 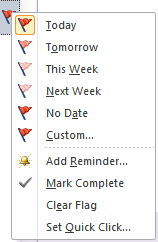 For outlook 2007 I just set up a rule to forward to outlook personal files inbox or you could forward the Imap to a pop account but that is a little redundant.